(22) S'rî Nârada said: 'Having said this, the original godhead and first living being of the universe sprinkled divine, all-potent water from his kamandalu [waterpot] over the body that was eaten by the ants. (23) He therewith was fully restored to the complete capacity of his mind, senses and strength. Like fire springing from fire wood, he arose from his anthill grown with bamboos with a fully endowed young body as strong as a thunderbolt that had a luster of molten gold. (24) When he saw the god right in front of him in the sky upon his swan carrier he, very pleased about that encounter, with his head on the ground offered his obeisances [compare B.G. 9: 23-24 and 2.3: 10]. (25) Rising to his feet before his own eyes seeing the Almighty One he, overwhelmed by jubilation, with tears in his eyes and his hair standing on end, with folded hands and a faltering voice, humbly began to pray. (26-27) S'rî Hiranyakas'ipu said: 'At the end of a day of creation, when he [Lord Brahmâ] under the influence of time is covered by the dense darkness of ignorance, this cosmic creation manifests [again] by the light of the rays emanating from his body. This world, endowed with the three basic qualities of rajas, sattva and tamas [passion, goodness and ignorance], is by him created, maintained and annihilated. That transcendental and supreme Lord I offer my respectful obeisances. (28) The original living being, the seed of creation, knowledge and wisdom, him, the deity of the life force, the senses, the mind and the intelligence who realized this manifestation by his passion, I offer my reverential homage. (29) Operating through the life force, you constitute the factual control of the moving and immobile creatures. You are the origin of all activities and the mastermind and source of insight of all living beings. You are the great Lord of the knowing and acting senses, the controller of the material elements, their qualities and the mind thereabout [compare B.G. 7: 7]. (30) By means of your body in the form of the three Vedas you promote the seven kinds of rituals [beginning from the agnishthoma-yajña] of the four kinds of priests [known as hotâ, adhvaryu, brahma and udgâtâ] and the knowledge required. You are the one soul without a beginning and an end of all living entities, the supreme inspirator and the True Self within. (31) Not affected by anything, you are [the personification of] the ever vigilant Time that, by each of its segments in the form of days, hours and minutes and such, reduces the duration of life of all beings. You are the cause of life of this material world, the Great Self and Supreme Controller who was never born. (32) Nothing exists separate from you, whether it is higher evolved or just lower, moves around or does not move. [Vedic] knowledge in all its divisions makes up the diversity of your body. You are the one golden principle of life [called hiranya-garbha] who, transcendental to the three modes, are greater than the greatest. (33) Oh Almighty One, you, as the one soul and oldest person invisibly situated in your supreme abode, manifested the externality of this cosmic manifestation by which you enjoy the senses, life air, mind and qualities [that you gave us]. (34) I offer my obeisances to you, that Supreme Lord who, endowed with spiritual ànd material potency, expanded to the unlimited, unimaginable form of this totality. Third revised edition, loaded January 9, 2019. S'rî Nârada said: 'Hiranyakas'ipu, oh King, wished to become unconquerable, free from old age and immortal, the one and only king with no rivals or opponents. In a valley near Mandara Hill he performed a most difficult austerity in which he, staring into the sky, raised his arms upwards and stood on the ground with the big toes of his feet. Emanating from the hair on his head there was a light as bright as a supernova that by its beams made all the gods doing penance turn back to their home bases. The fire that, generated by his severe penance, together with smoke spread sidewards, upwards and downwards, heated all the worlds. The rivers and oceans were in turmoil, the islands, the mountains and the earth shook and the stars with their planets fell, while the ten directions were ablaze. Scorched by it the demigods gave up their residences and went to Lord Brahmâ's place to tell their leader: 'Oh Master of the Universe, we are all afflicted by the penance of the daitya king and no longer capable of keeping our position in heaven. Please, can you do something about it and put an end to this, oh Lord of the entire world, before everyone, who offers you worship, oh chief of all, is lost. Just consider what he [Hiranyakas'ipu] has in mind, performing that most difficult penance. You of course know everything about it - but we nevertheless would like to submit it to you. [This is what he considers:] 'Lord Brahmâ, who, by his austerity absorbed in yoga, created the moving and unmoving living beings [see 3.8], has his throne in all the worlds high and low. I, by dint of an even more severe penance [than his] being absorbed in yoga, will, from the eternality of time and the soul, achieve the same for myself. We discovered that he, in his severe penance, is of this resolve. Can you please, according to your own judgement, take the necessary measures, oh master of the three worlds? Thus being informed by the godly souls, the most powerful person, he who was born on the lotus, oh King, accompanied by Bhrigu, Daksha and others, went to the place of penance of the daitya lord. Being covered by an anthill, grass and bamboo and with his fat, skin, flesh and blood eaten away by the ants, he could not be spotted any longer. But he who rides the swan smiled with wonder when he saw how he, like a sun covered by clouds, heated all the worlds by his penance. S'rî Brahmâ said: 'Please appear, show yourself, oh son of Kas'yapa! All good fortune to you who are so perfectly of penance. I, the granter of boons have arrived. Let your wish be my blessing for you. I have personally witnessed the great power you are carrying and how wonderful it is that someone whose body is eaten away by worms and ants can manage to keep his life air confined to his bones. No sage before you ever did this, nor will any other do so hereafter. Who can sustain his life-air for a hundred celestial years [36.000 years] without taking a drop of water? Oh son of Diti, by your resolve to be of this penance, that even for the greatest saints is very hard to perform, you have won me. S'rî Nârada said: 'Having said this, the original godhead and first living being of the universe sprinkled divine, all-potent water from his kamandalu [waterpot] over the body that was eaten by the ants. He therewith was fully restored to the compete capacity of his mind, senses and strength. Like fire springing from fire wood, he arose from his anthill grown with bamboos with a fully endowed young body as strong as a thunderbolt that had a luster of molten gold. When he saw the god right in front of him in the sky upon his swan carrier he, very pleased about that encounter, with his head on de ground offered his obeisances [compare B.G. 9: 23-24 en 2.3: 10]. Rising to his feet before his own eyes seeing the Almighty One he, overwhelmed by jubilation, with tears in his eyes and his hair standing on end, with folded hands and a faltering voice, humbly began to pray. The original living being, the seed of creation, knowledge and wisdom, him, the deity of the life force, the senses, the mind and the intelligence who realized this manifestation by his passion, I offer my reverential homage. Operating through the life force, you constitute the factual control of the moving and immobile creatures. You are the origin of all activities and the mastermind and source of insight of all living beings. You are the great Lord of the knowing and acting senses, the controller of the material elements, their qualities and the mind thereabout [compare B.G. 7: 7]. By means of your body in the form of the three Vedas you promote the seven kinds of rituals [beginning from the agnishthoma-yajña] of the four kinds of priests [known as hotâ, adhvaryu, brahma and udgâtâ] and the knowledge required. You are the one soul without a beginning and an end of all living entities, the supreme inspirator and the True Self within. Nothing exists separate from you, whether it is higher evolved or just lower, moves around or does not move. [Vedic] knowledge in all its divisions makes up the diversity of your body. You are the one golden principle of life [called hiranya-garbha] who, transcendental to the three modes, are greater than the greatest. Oh Almighty One, you, as the one soul and oldest person invisibly situated in your supreme abode, manifested the externality of this cosmic manifestation by which you enjoy the senses, life air, mind and qualities [that you gave us]. I offer my obeisances to you, that Supreme Lord who, endowed with spiritual ànd material potency, expanded to the unlimited, unimaginable form of this totality. If you are willing to grant the boon that I desire, oh my Lord, oh best of all benefactors, then make it so that I will not die because of any of the living beings created by you. Neither at home nor outside, neither during the day nor at night, neither from any known weapon nor by any other thing, neither on the ground or in the sky, nor by any human being or animal I may die. The drawing is titled: "Satan before the Throne of God". It is from 'Illustrations to the book of Job' (Linnell set, obj. 2). 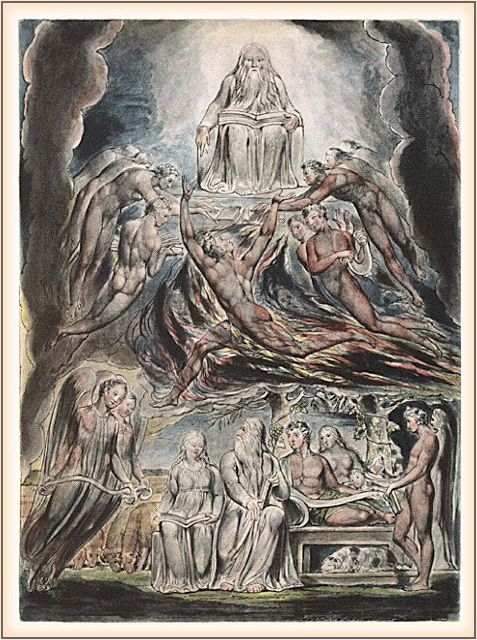 It is of William Blake 1821. Source: William Blake Archive.